On October 12, 1492, Italian explorer Christopher Columbus made landfall in what is now the Bahamas. 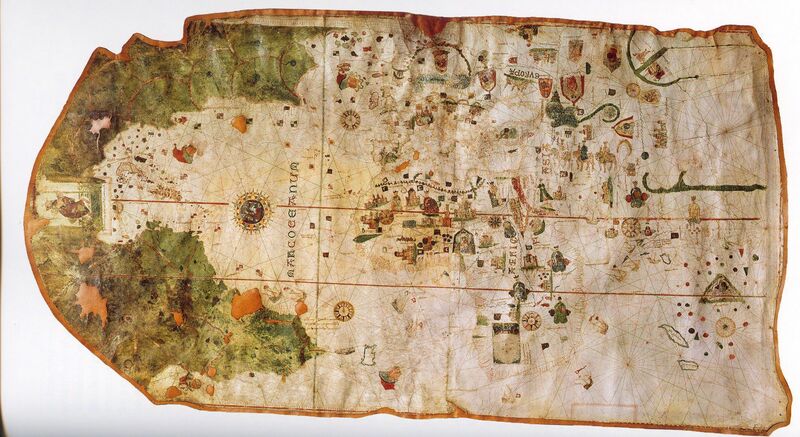 This map is the earliest definitive depiction of the Americas by a European. It was drawn by Juan de la Cosa, a cartographer who accompanied Christopher Columbus on his first voyage to what would soon be known as the "New World." De la Cosa was also the owner of the Santa Maria, the largest ship in Columbus' small fleet. On October 12, 1492, Italian explorer Christopher Columbus made landfall in what is now the Bahamas. Columbus and his ships landed on an island that the native Lucayan Taino people called Guanahani. Columbus re-named it San Salvador. No one is quite sure where Guanahani/San Salvador is. Columbus describes the island as “very flat, with very green trees,” and a “very large lake in the middle.” That describes hundreds of islands and atolls in the Bahamas! Columbus isn’t even clear if Guanahani/San Salvador is a single island or a small archipelago. Juan de la Cosa was a cartographer sailing with Columbus. (He was also the owner of Columbus’ largest vessel, the Santa Maria.) De la Cosa made a map of the voyage years later. While he rather accurately represents the position and shape of the islands we know as Cuba and Hispaniola, the position of Guanahani/San Salvador is unclear. Historically, most people thought the island first sighted by Columbus’ crew was Watlings Island. In fact, the name of the island was changed to San Salvador in 1925. (It is still called San Salvador today.) However, a National Geographic investigation in the 1980s claimed the real site of Guanahani/San Salvador is the uninhabited island of Samana Cay. Still other historians think Guanahani/San Salvador is the nearby Plana Cays. a coral reef or string of coral islands that surrounds a lagoon. workers or employees on a boat or ship. process involving examination and research into a topic or situation. to stand for a person, community, or idea. native people of parts of northern South America and the Caribbean. place where no people make a permanent home.